Igor, what do you think about the discussion about the fact that armfights steal the importance off the "Zloty Tur” World Cup? Indeed, the combination of the Armfight with the Professional World Cup leads some observers into slight bewilderment. But, I am sure that this refers to outside observers only, not the participants and spectators of the "Zloty Tur" in its new form. The matter is that we receive only positive feedback as from spectators, as from the athletes. Armfight, with its intrigue and emotionality, added new colors to the bright stage of the World Cup, added entertainment and emotions. If we talk about this combination from the point of view of the armwrestler’s career, then I would like to draw the reader's attention to the following fact. "Zloty Tur" appeared earlier and today can perfectly exist without armfights, by itself. But armfights can not exist without "Zloty". At least those that boost the interest of the general public. All participants of the armfights took part in the Professional World Cup. There is only one extraordinary exception - Devon Larratt at the Vendetta All Stars this year. The World Cup is the only place where we are looking for interesting matches and confrontations. And there will be no other way. As for the titles, the title of the World Cup winner is equated to the title of the World Champion in the professional arm wrestling. And in those weight classes, where the official PAL armfights are not held yet, this title is the highest point of professional career as of today. Armfights opened the way to the heights of professional arm wrestling for the new talents. The "withdrawal" of the strongest athletes to the armfights not only freed the pedestal of the "Zloty Tur", but also set new tasks for the stars themselves. "Zloty Tur" is a classic tournament grid and a winner determination system. Armfight is a new direction in our sport and it is based on a different approach to training and organization. Today in the world sports industry there is a tendency to create new formats in seemingly traditional sports such as boxing, rugby and others. The audience's preferences have changed very much over the past 15 years and those disciplines that remained where they were in the 70s of the 20th century are left out of the public spot light. Armfight is the answer to the question "is there life after the victory at the World Cup?". And in conclusion, as usual, a little bit of insider information. As I have repeatedly said, for PAL, there is only one objective international professional rating - the results of the "Zloty Tur." But as of today, professional armwrestling, in fact, is no longer fit into the framework of the World Cup. For example, this year, we expect the tournament to have the largest influx of athletes and spectators in its history. But our opportunities, unfortunately, are not unlimited. Therefore, now the PAL team is working on the Professional Arm-wrestling Rating (PAR), on the basis of which the selection of participants of the Professional World Cup professionals will take place. 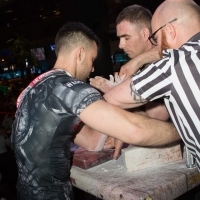 Moreover, the World Cup itself will be the key division of the rating, after which, the athlete will get a chance to get into the top elite division, Top-8 of the world armwrestling and get a contract with PAL. The launch of the professional rating is scheduled before the World Cup. In other words, 2018 will be the last year, when everyone will be able to come to the “Zloty Tur” World Cup. To the professionals who will want to qualify for the Professional rating this year, I recommend using this opportunity. Summarizing, I will say that, contrary to the expectations of the "experts", the Professional World Cup is just starting to gain importance and prestige.